Removing unneeded text from a text document can be a speedy or slow process. It's relatively easy if the text that has to be removed is not linked to other text that should not be removed, say paragraphs of text. It becomes difficulty if the text that should be removed is merged with text that should say. One classic example is a html link list. Extracting only the urls of the links would mean to cut the beginning html tags and the end tags from the text document which would mean some work in a text editor. The find replace function could be helpful but it still means a time consuming process. Text Trimmer (via Shell City) is a text editing tool that has been designed for that purpose. It comes with different modes that can be used to easily remove text from documents. It makes use of two modes Block and Mass that can remove unneeded text from documents easily. The Block mode can be used to mark a block of text in a text document that can be removed, copied or moved. 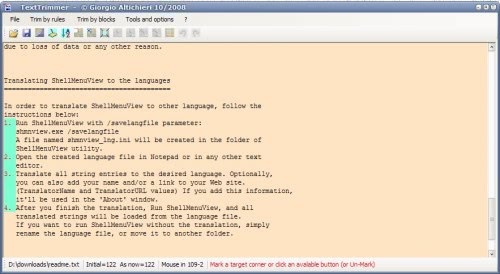 It would for instance be possible to remove the first 20 characters of text from every line in the document which is not doable in normal text editors. Text Trimmer can do that with just a few clicks. The combination [ALT Left-Mouse Click] selects the upper left starting point for the block, the next use of the combination selects the lower right end point. Everything in between will be marked by the software program. The Mass mode on the other hand is rule based which means it can be used to mark blocks based on rules defined by the user. It is for instance possible to mark all lines starting, showing or ending with the < char or trim all text from the beginning to a certain character.The operations are easily accessible and it usually takes only a few seconds to define the text that should be trimmed and remove it from the document. Text Trimmer is a portable software for Windows. The block select has been around for a while — Notepad++ has always been able to alt-drag a rectangular block of text.